In the early days of organised football in Ireland a County Antrim select could be regarded as almost as strong as any potential Irish international XI that could be fielded. 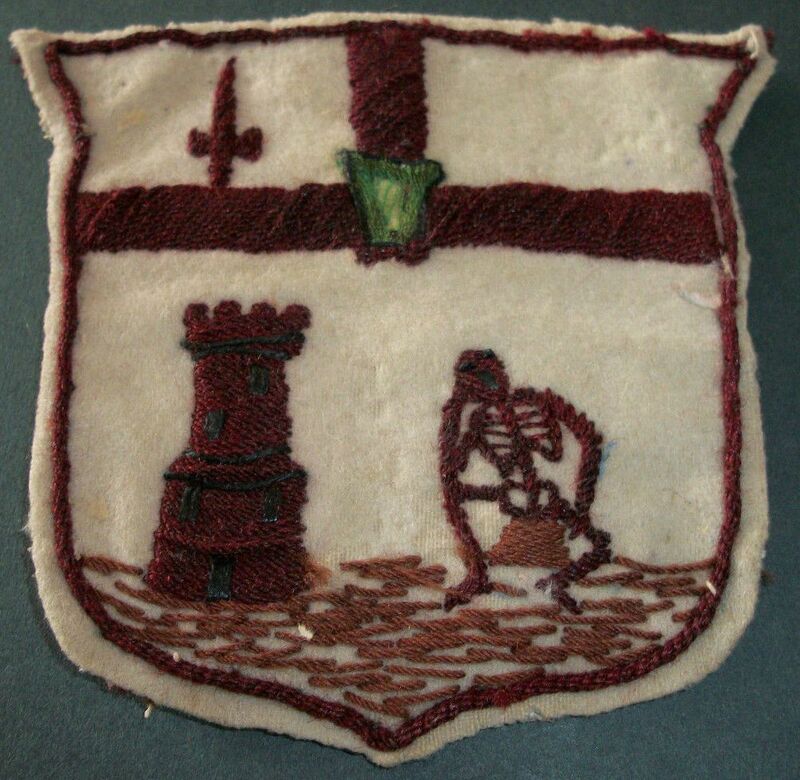 Indeed, when a Canadian touring side visited these shores in 1888 it was the Co. Antrim FA that hosted them. 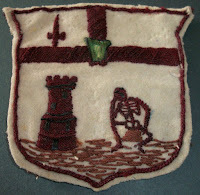 As with the inter-provincial matches of the same era, the matches in the 19th century were often used as international trials. 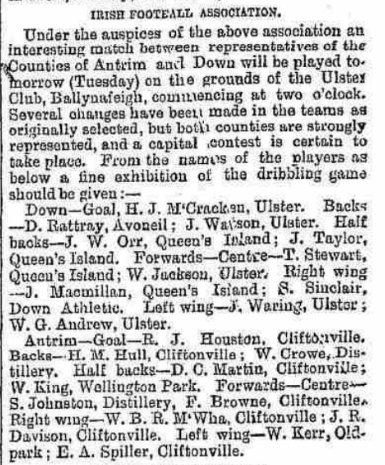 Over the years the Co. Antrim & District FA (the boundaries were stretched to include all of Belfast in 1896) have fielded sides against county teams from across Ireland and Britain as well as other representative selections. 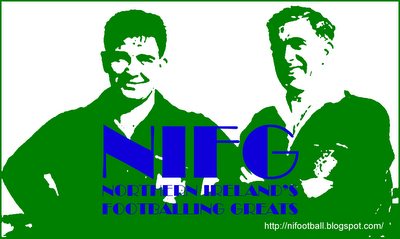 In the early days of football there was also a strong hold of the kicking game in the area controlled by the County Londonderry FA (now the North West FA), where a number of teams made an impact on national competitions. 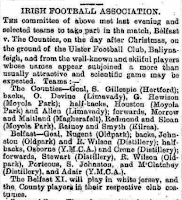 Hence, it was a Co. Derry XI that proved the Co. Antrim's most regular opponent in those formative years, a regular series of Boxing Day matches commencing in 1884. Also listed below are inter-city matches. More research is required to decide whether these fit into this category, or a category of their own. Belfast: J. Watson; H. Davis, J.M. Mack; R.M. Sloan, W.A. Glass; W.T. Herron, W. Jackson, J. Henderson, R. Hughes, J.A. MacDonald, A. Murray. The largest scoreline ever recorded in a game in Belfast up to this date. Ayrshire's John Goodall was elder brother of Archie Goodall who was capped ten times by Ireland between 1899-1904. No match result of report found. J. Rankin (Limavady) and J. McConnell were originally selected for Derry, their places going to McCarroll and Allen. For Belfast, McCartney came into the team. Changes to the Counties team that took the field included Cartright at half-back and McVicter in the forward line. No match report or result found. 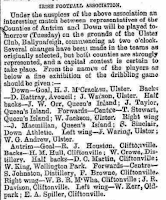 Gaffikin may have played for Co. Antrim based on a later match preview. Match played in heavy mist. Match cancelled at short notice as the North West FA could not raise an eleven, a fact only communicated to the crowd when they were already in the ground. 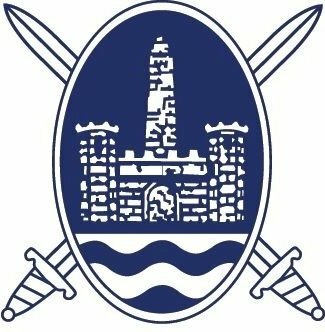 The Co. Dublin team was retrospectively renamed Leinster by some sources. This match was played on the same day as Ireland faced England in Derby, hence the selections were weaker than might otherwise have been expected. Kearns replaced Johnston (Glentoran) from the originally selected Belfast XI. Belfast were without the services of Linfield and Cliftonville players as they played a benefit match for Sam Torrans on the same day at Solitude. Lynch and McGahey of the originally selected Derry XI did not travel and their places went to Douglas and McIntyre. Belfast wore white with a red hand and Derry wore green. 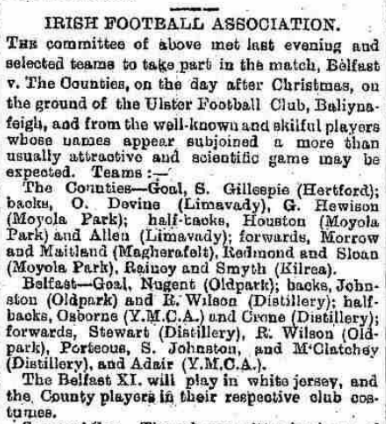 The match was organised in conjunction with the Derry Trades & Warehouse League, hence the way in which some of the players' clubs are listed. Belfast were denied the services of any Distillery players as the match coincided with their meeting with Shelbourne in the Irish Cup final. Derry could not select players affiliated to Derry Celtic as they were not members of the North West FA. Belfast wore white and Derry wore red. Nash replaced Hope (Enniskillen Celtic) from the originally selected Derry side. 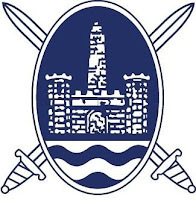 The Dublin side is alternatively listed as Leinster in some sources.